HomeNewsPress ReleasesGet Ready to Run in Michigan’s Save the Manatee 5K! Get Ready to Run in Michigan’s Save the Manatee 5K! Many join together at the Michigan 5K each year to help the manatees! The annual Save the Manatee 5K returns May 21st for its 13th year at the Lake St. Clair Metropark in Harrison Township, Michigan. The 5K, 2 Mile Fun Walk, and Mini Manatee Mile is expected to draw over 1,200 participants to raise awareness about endangered manatees, one of America’s most cherished species. Proceeds from the 5K go to support the education and conservation work of Save the Manatee Club, a Florida-based, international nonprofit organization. 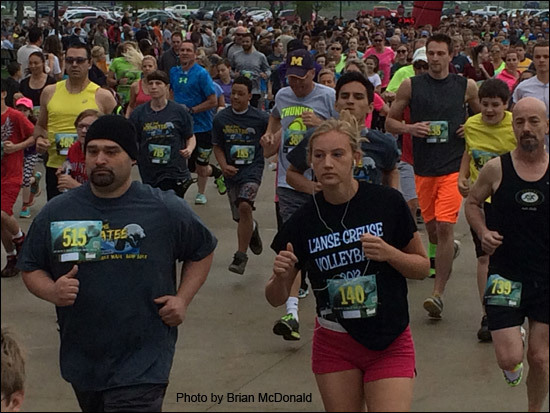 Led by biology teacher Lesley Argiri from L’Anse Creuse High School, the Michigan 5K has raised over $100,000 since its inception. “I believe the Michigan 5K has the opportunity each year to make more people aware of the manatee’s existence, the many threats they face, and what people can do about it,” said Lesley. Adding to the excitement and success of the race was the addition last year of the Virtual 5K, which opened up the Michigan race to participants anywhere in the world. Joggers, kayakers, cyclists, and swimmers, to name a few, now have the opportunity to take part in the event and support the manatees. Participants in the May 21st race in Michigan or in the Virtual 5K receive a race packet with a unique t-shirt and manatee race bib. This year, a newly-designed medal in silver and blue featuring a manatee in an aquatic setting will also be given to all race participants. Medals are awarded to the top three finishers in the 5K, as well as trophies for overall male and female and overall male master and female master. This is a dog-friendly event, and each receives a canine finisher medal. The event is held on a paved, flat and picturesque course along Lake St. Clair. The park entrance fee of $10 is not included with race registration. This year’s Master of Ceremonies is Michigan State Representative Anthony Forlini. After the race, look for Cora Berchem, Save the Manatee Club’s Multimedia Specialist, at the Club’s education table. Race participants can pick up education materials and also adopt one of 34 real manatees from Save the Manatee Club’s Adopt-A-Manatee® program. “We are humbled and honored by Lesley’s hard work and selfless support over the years, and for all she has done and continues to do for Save the Manatee Club and manatees,” said Patrick Rose, Executive Director of Save the Manatee Club. For more information and to sign up for the 5K on May 21st or for the Virtual Run, go to Everal Race Management web site or register at the Manatee 5K Race website. Questions? Contact Race Director, Lesley Argiri at largiri1@hotmail.com.